Here is the card I made this week for the sketch over at 2sketches4you. The fabulous sketch was done by the amazing Kazan this week. I am really glad that I had a chance today to finish my card because it seems like the weeks are getting away from me and I don’t get as much time to scrap as I wish I could. All supplies are from Stampin’ Up! with the exception of the button (My Mind’s Eye), the pins (Heidi Grace), and the thread. Your colors rock! And this is just gorgeous! Wow. Such a pretty card! I love the pins! Where did you find them? I still haven't found them for myself anywhere yet...thanks for sharing your card. I know what you mean about the weeks getting away...I can't believe it's almost Spring...but I am glad about that, too. Jayna (my 6mth baby) is getting seemingly close to crawling so I figure soon I will have even less time to craft than the little I have already. Good luck finding time! Amy your work is beyond goreous! Love the colors and how fresh this card is. Ah, I just love the spring feeling this card gives me, so gorgeous. Oh my word! Truly Breathtaking :) The curled paper, the button and stick pins.. love it all!!! Beautiful card and I love the pins. so far not so much. Awesome card! Congrats on the Fab 5! Such a lovely card, my friend! Congrats on making the Fab 5 -- I'm excited for you! This is such a pretty Spring card! Congrats on being in the fab 5! Congrats on being in the fab 5! 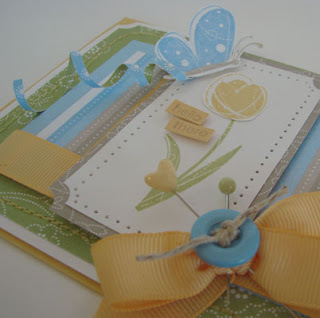 Your card is so soft and full of spring love it!! What a beautiful card!! It is stunning! The ribbon and the twine and the pins....I could just keep going!! Beautiful! 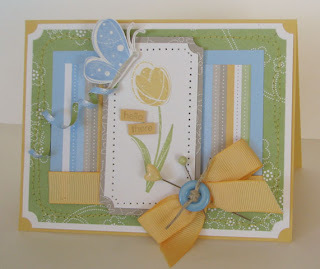 What a beautiful card, your blog is incredible! Glad I found it. Gorgeous card!!! I love the spring colors!! Congrats on making Fab 5! amazingly beautiful card! looooooove the butterfly trail!